What’s CarryBee (AGV)? | AGV (automated guided vehicle), automatic guided vehicle system Aichi Machine Techno System Co., Ltd.
HOME > What’s CarryBee (AGV)? Carry Bee is an unmanned carrier developed with our own long cultivated know-how in the automobile production as a group company of Aichi Machine Industry Co., Ltd. with over 100-year history. 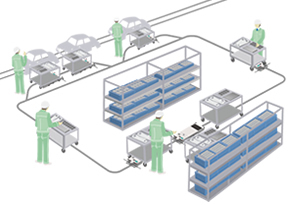 It can rationalize manufacturing processes in various scenes such as conveyance between processes, parts supply to production lines and cellular manufacturing lines(assembly on AGV). 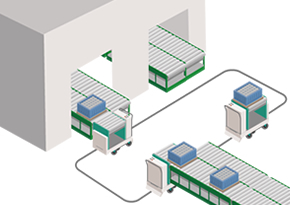 Carry Bee (AGV) runs smoothly to convey loads. The high quality of our AGV providing straight running and cornering is very popular with a wide variety of customers in many industries. You may be afraid that AGV installation is very expensive. There is no need to worry. Our main product, the dolly type AGV, is inexpensive. 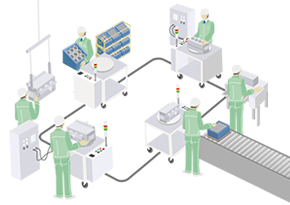 You can build more effective and productive lines without changing the existing lines as Carry Bee can be installed by the simple application of magnetic tapes. We offer various options to meet any needs of production lines. The options cover various patterns such as noncontact charging or sensor for the prevention of accidents.